Vote for us so we can get an outdoor classroom! New Clubs are coming to CMIT! We would like to welcome to our team, our new Student Support Specialist Mr. El. He will be joining our team and is happy to be apart of the CMIT family. Please help us celebrate Ms. Addie and Ms. Rosalia. They are always eager to work with our students and help out in any way. Words can not express the value they bring to our CMIT Family. They will enjoy parking in the front reserved spaces for the Month of March. 1. Parents please do not use the parking lot of our neighbors, they have begun to fine us for using their private property. 3. If you have to drop off in the front because your are running late, 7:50-7:54. Please drop them off and keep it moving. If you park, not in a space, and have to triage your scholar prior to allowing them to come to the door you are creating the back up. If you have to park please pull into a parking space. 4. SLOW DOWN - students are walking in the cross walk and parents almost on a few occasions this week have almost hit scholars walking in the cross walk. 5. At 7:55 students are late and parents must sign them in. Please and thank you. Its Women's History month and we here at CMIT are celebrating the women in the building. Our staff is full of history and interesting facts. Our mobile rewards store is now open. This rewards system offers students a chance to cash in roar bucks earned for good behavior. Parents please send in donations of small toys for this cart. We need stickers, bouncy balls, pencils, pencil grips, etc. Thank you for you support. All items purchased for the cart thus far were earned from scholastic points from the last book fair and Wegman's Lanham. Your children were very excited to shop. The roar cart will be opened every other Friday. The Roar cart will visit the school on March 17th! Please see our donation link below! Students should bring in their $10 club fee as soon as possible. It is time to get all of our supplies. Students should bring in a personal snack on club days. We have our first amusement park ride completed. We had an amazing time. We will continue work in groups completing all activities for our competition on April 26, 2017. Parents are welcome to meet us at the event. Competition details will be sent on Class dojo. Our Spring Fundraiser with Mid-Atlantic Fundraiser kicked off Feb. 28, 2017 during lunch times. Students may sell gifts, kitchen items, flowers, seeds, popcorn and more! Students will had two weeks to sale their items. All orders are due March 14, 2017. Orders will be back before Spring break. Our top sellers from our last fundraiser will go on their limo ride to Chuck E. Cheese April 7th! Thank you for your support! Please vote once each day. Have all you family, friends, and co-workers vote as well. Each email can only be used once each day. Share this link on social media! 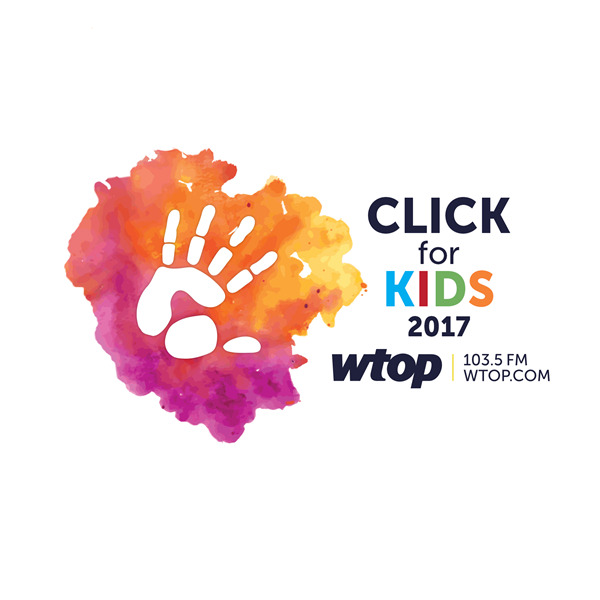 Be sure to select Prince Georges county, and Chesapeake Math & IT Elementary school. Thank you for your support! Laurel Library would like to share with you a new program they are starting. It is called Kids Achieve Club and it will be an opportunity for students in Grades K-6 to receive homework assistance from trained volunteers. It is drop-in, there is no need to register, and it will be there at the library, every Wednesday afternoon from 4-6pm, until May 24, 2017. Although it is aimed at children whose home language is not English, it is open to everyone who may benefit from it. There are attached flyers (in English and Spanish) for you. In the coming weeks, all students in grades five and eight in the state of Maryland will participate in the Maryland Integrated Science Assessment (MISA). The Federal Every Student Succeeds Act requires Maryland to test science content at least once in the elementary and once in the middle school grades. This is an online assessment based on the Next Generation Science Standards which the state of Maryland has adopted for their curriculum. Schools taking the online test will create a schedule in order for students to access computers and take the test between March 13th and March 31st. A paper format of the science test will be available to any student needing this format and they will test on March 13th through March 24th. 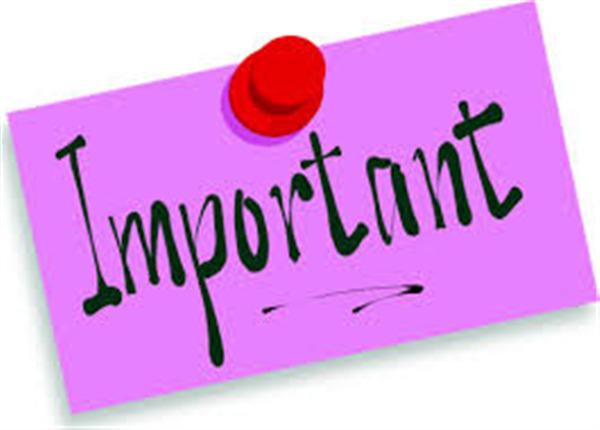 All make ups for schools administering the paper test must be complete by March 24th. The test is administered over two days and will take approximately two hours each day. The test will include both selected response and constructed response items. This year the online version of the test will also include Technology Enhanced Items. It is extremely important that your child is in school and on time each day of testing. Make-up testing is required for all students. Students may not be permitted to test if tardy on their assigned testing day. ***Your child arrives to school on time. ***Your child eats a substantial breakfast in the morning that will give him/her the necessary energy and alertness for participation in testing. ***Your child gets a good night’s sleep the night before each testing day. ***Your child is in school every testing day. Children absent on a testing day will participate in make-up testing. ***You encourage your child to do his/her best! Thank you for your help. We know our students will do their best! Should you have any questions, please call the school. Please come in and collect your items. We are busting at the seams. We will be donating items by April 13, 2017. Prince George’s County Public Schools (PGCPS) will be administering the Math Inventory (MI) in grade 2-5 between March 6th and 10th, 2017.The MI is a classroom-based assessment that measures mathematics achievement and growth. This provides one source of evidence about a student’s math achievement. Scores are reported using a measure called the Quantile® measure. This information can be used to monitor progress and set goals for instruction. The testing will last approximately one hour. Please avoid appointments that may take your child out of school during this time period. You can help your child by ensuring that he or she is physically and mentally prepared. Make sure your child has a good night’s rest and a healthy breakfast. Help your child to have a positive attitude toward testing! If you have any questions concerning the scheduling of these tests, please contact your child’s school. We have new clubs that are coming to CMIT! 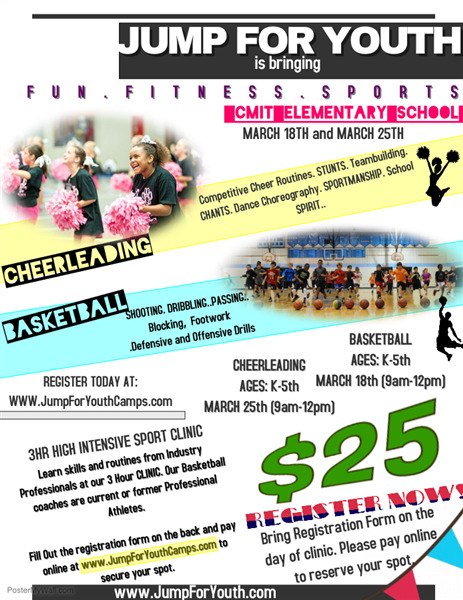 The letter and attachments below are sent on behalf of Jump for Youth. I am happy to announce that math kangaroo competition is right around the corner. We have worked on this competition really hard during the year. There will be 13 students to compete on Thursday, March 16 2017. 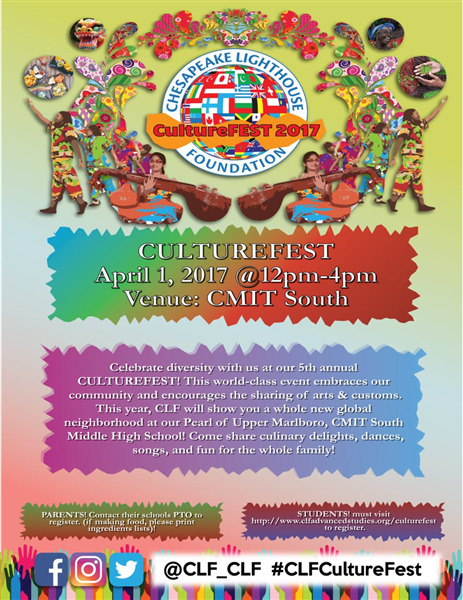 CultureFEST will be held at CMIT Academy South, 9822 Fallard Ct Upper Marlboro, MD 20772, on Saturday, April 1, 2017 from 12:00-4:00 p.m. This is a wonderful, annual activity where all the Chesapeake Lighthouse Foundation schools come together and celebrate our diversity! Activities include Parent Sponsored Food and Cultural booths, vendors, student culture booths, and performances from all CLF sponsored schools as well as professionals! Mark your calendars and come support all the students in our CMIT community! If you are interested in hosting a food or cultural booth or would like more information on how you can participate and support, please contact PTO at cmitespto@gmail.com or Ms. Santiago at jlsantiago@cmitelementary.org. There is a special homework assignment this week! We need students to disguise a leprechaun! Students will develop a plan and execute to create this disguise and write a story about their "not a leprechaun." The assignment will be due on Friday, as normal, and students should be prepared to talk briefly about the story they create and disguise they chose! We will read the story "If I Could Go to Antarctica." It is an informational text about the animals, plants, and terrain of Antarctica. We will be working on classifying and categorizing. We will also be reading with words having the medial /e/. Over the next few weeks, students will be learning about various life cycles. 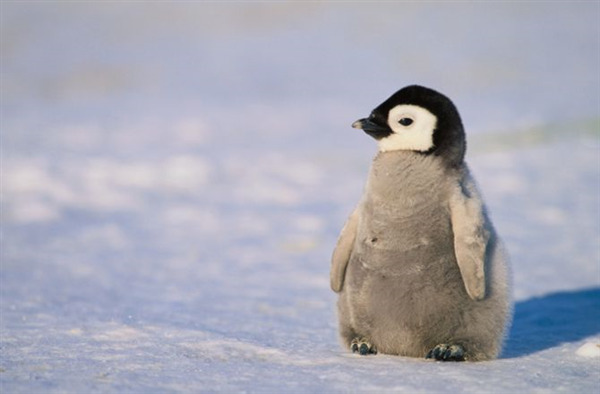 This week, we will be learning about the Penguin Life Cycle. - With the weather fluctuating, remember that we still go outside for recess when the weather is above 32 degrees Fahrenheit. Please ensure that your child is dressed appropriately! First grade will be working on chapter 14 this week. Chapter 14 is working 3D shapes. Students must be able to define each shape. We are working on Chapter 3, Land and Water. How humans effect the environment. Describe different land and water features. Students will build a cool car out of 50 legos and bring it in on March 15, 2017. This month third grade students will develop a human life cycle of their life. They will combine this project with the advancements of technology. The expectations for completion of the project will be provided to the students next week Monday, 3-13-2017. The projects will be due on Monday, 3-20-2017. Progress reports went home on Tuesday, 3-7-2017, please check SchoolMax to view the progress of your student. Grades are added and will affect the progress reports that were sent home. 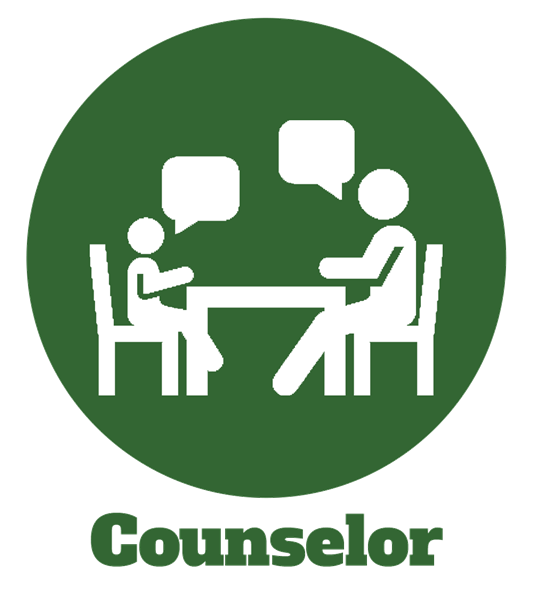 If you have any concerns please feel free to schedule conferences with your child's teacher. This week in Science students will continue to develop models to describe organisms that have unique and diverse life cycles but all have in common birth, growth, reproduction, and death. In math this week students will be assessed on Monday 3-13-2017, on the comparison of two fractions with the same numerator or the same denominator by reasoning about their size. Recognizing that comparisons are valid only when the two fractions refer to the same whole. Recording the results of comparisons with the symbols >,=,< and justifying the conclusions by using a visual fraction model. They will move on to reasoning with shapes and their attributes this week as well. Social Studies the students will explain why people must make economic choices identify and apply the steps in the decision-making process identify the opportunity cost of a choice or decision. Students did a great job on their Women's History Month Projects! We all learned so much about several strong, successful women and how they have contributed to STEM. This week in Character Education, we focused on goal setting. We each set academic goals based on MAP scores and progress report grades. Next week, we will focus on writing a plan of action for how we can accomplish those goals. In a few weeks, we will check back in on our progress! 5th graders worked on finding the volume of cubes and solid figures. They’ve learned that solid figures must first be separated into two “rectangular prisms” before each prism can be solved; using the formula (Volume = Length x Width x Height.) We completed Topic 10 by measuring the size of boxes to find their volumes. I am hopeful many of you have been considering coming to the 4-part series on behavior that I am hosting, starting next week. I am very excited to begin these collaborations, and I can't wait have you be a part of them! You will find this information specifically under "Coffee Collaborations". While you are there, please check out the other posts, and comment! I find their articles and resources fantastically helpful (regardless of a diagnosis of ADHD or not). The post they published yesterday was too good not to share! I participate in so many meetings here at CMIT as the School Counselor, and I have also sat in a different seat at the table. There are times where the tension is palpable, times where tears are shed, and times where cheers are heard and hugs received. A client emailed me in a bit of a panic. She asked if I could offer any words of wisdom, or a ‘mantra’ for her to run through her mind – something to help her keep her from getting defensive. She was dreading a school meeting with teachers about her 8th grader, expecting them to tell her a variety of things that her son is not doing well. Why else would they call her in for a meeting? We emailed back and forth about how she could approach the meeting in order to get the best results. She tends to get triggered and defensive, and she just wasn’t ready to hear “a lot of negative things” about him. We talked about how she could “design” the meeting with the teachers, a strategy to clarify communication. We are always designing our relationships in life. This technique allows us to do it consciously. Wedding vows are an example of “designing” the relationship of a marriage. “Class rules” in a school environment is another familiar example. Acknowledgment: Start with thanks and a little team-building. Acknowledge the teachers for how much they’ve been doing to support your child; thank them for being on her team; show your gratitude for having a school that is really working with you; indicate that its clear that everyone wants what’s best for your child. Teachers do not get enough acknowledgement – this is your chance to connect. Transparency: Tell them that they can count on you to be as open as you can in this conversation, and that you will work with them and with your child to get the best outcomes. Let them know that you find these meetings difficult because you are a little out of your element, so ask them if they’d be willing to help you stay open by starting with something simple. Play to Strengths: Ask if they’ll start with the positives — what’s going well, or at least better. It’s okay to say that you know there’s going to be challenging feedback. But explain that you find it really helps to point out what’s going well, first. This is especially true because the best solutions are found in the successes! Keep Breathing: When they point out a problem, just take a deep breath and let it out before you respond. Take Aim: As you take notes, create a separate list the specific behaviors they point out as problems. Near the end of the meeting, re-cap the list and ask if there’s anything else they are concerned about. Then, ask them which ONE they think is most important to start with? Explain that if we ask your child to work on too many things at once, it can cause overwhelm, and it’s really important to target something very specifically so that your child can have a success and build on that going forward. Trying to change too many things at once is a recipe for failure, but focusing on one thing at a time is a recipe for success. Remember: You’re on the same team! Isn’t it time to stop dreading school meetings with teachers? The next time you get “called in” to school, take a few minutes to design your approach, so that you can stay out of defense mode, and open to possibilities! Hello Families! We have been discussing sequence of events and story comprehension for the past few weeks. Here are some helpful links to help your scholars practice at home. 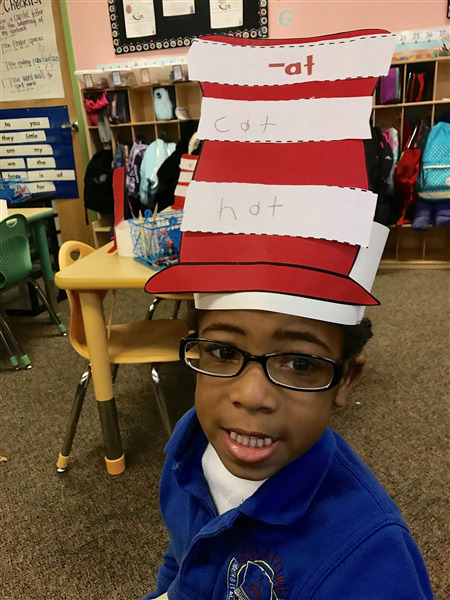 When practicing these strategies with your scholars, let them pick the book. If they are interested in the book, they are more likely to retain more information. CMIT Elementary School is providing an opportunity for students to show off their creativity and Engineering abilities with a Lego Challenge. 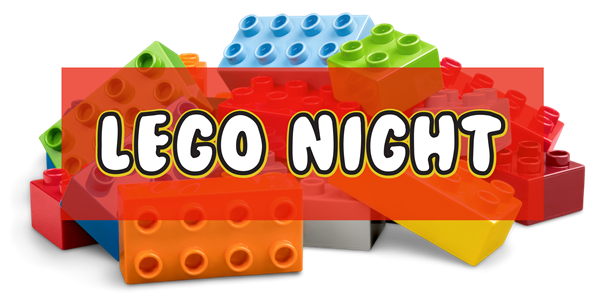 All submissions will be showcased at our third annual LEGO NIGHT, held on Friday March 24, 2017 from 6:00pm to 7:00pm. See the chart below to find your child’ grade level challenge	requirement. Note: Projects must be constructed at home and may not be a prepackaged Lego kit. The key to this challenge is CREATIVITY. Kindergarten Animal: Build your favorite animal. 1st Grade Car: Build a cool car. 2nd Grade Transportation: Build any type of vehicle. 3rd Grade Robot: Build your favorite robot. 4th Grade Symbol of Maryland: Create a Lego structure That symbolizes our state. 5th Grade Architecture: Design a Lego structure representing A particular style of architecture. You may want to research different cultures or time periods to aid in your design. All entries must: Arrive at CMIT Elementary School no later than, March 15th,2017. Be delivered in a shoebox (The student’s name and grade should be clearly written on the box). Feature a base for the structure no larger than 6” by 12” Please remember to follow the Lego piece requirement for each category. All projects will be on display at the 3rd ANNUAL LEGO NIGHT on Friday, March 24, 2017. If your child is interested in participating in the 3RD ANNUAL LEGO NIGHT. Please fill out the bottom portion of this Letter and return to Mr. INCI latest by: Wednesday, March 15th,2017. Participating students will receive extra credits for Lego class and students will be given certificate of participation. It is with great joy that I announce that we had two works of art selected to go on to the YAM juried art show! Out of the 208 schools in PGCPS 207 were represented at the art exhibit at The Mall of Prince George's. Each school selected 12-15 works of art. There were 20 works of art selected from lower Elementary pre k-2), we have two scholars selected from this group! 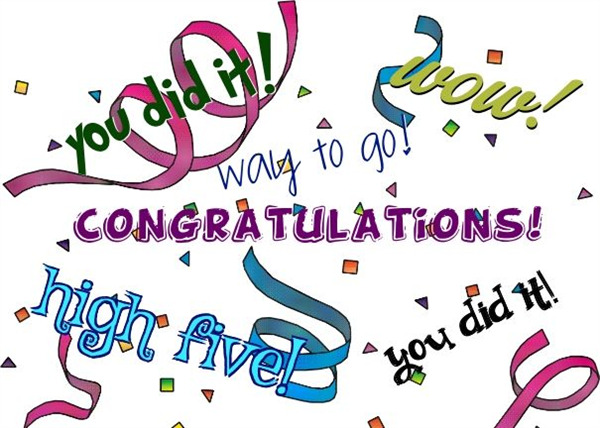 I would like to give a huge congratulations to Cassidy Salisbury (2nd Grade) and Josephine Davis (1st grade). This is a huge honor for our scholars! If you were unable to see the art exhibit the art is now on display near the art room. Way to go Josephine Davis and Cassidy Salisbury! Congratulations to Jala Scott (1st), Caitlyn Wedderburn (3rd), Zahria Mosley (4th), Haley Hunt (2nd), Adonis Wilson-Graham(2nd), Bryce Albery (4th), Gabriella Romero (k), Rosibel Ortiz (3rd), Morgan Virgil (4th), Emnet Theodros (5th), Aaron Stills (2nd) who also represented CMIT Elementary at the art exhibit! The PTO is excited to announce the St. Patty's Day After School Dance Party from 3-5PM on March 17th. The PTO is requesting donated bottles of water, individually bagged chips, bananas, oranges, granola bars and juice boxes. Items can be left at the front desk or during Friday morning drop off. On Friday morning during drop off, the PTO will have a cart outside to collect any food donations. Tickets are $8 on/before March 16th and $10 on March 17th. Flyer with more information is attached.